Manuel Marchena, the judge chosen to preside over the Spanish judiciary following an agreement between the ruling Socialists (PSOE) and People’s Party (PP), has decided to back out after a leaked chats scandal hinted at political meddling in his appointment. In a letter made public on Tuesday, Marchena explained that he ‘never conceived of the judiciary as a tool servicing certain political positions in a criminal case’ and he stressed his ‘independence’ as a judge. 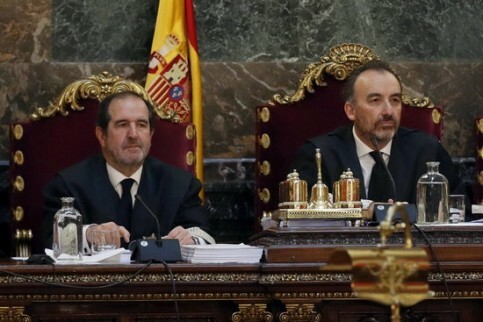 Marchena will thus keep his post as the head of the Supreme Court’s Second Chamber, meaning he will preside over the trial against Catalan leaders accused of rebellion for organising a referendum on independence. In a message leaked to the press on Monday, the PP Senate spokesperson, Ignacio Cosidó, suggested that Marchena’s appointment would benefit the conservatives, and added that they would ‘control from behind the scenes’ the court chamber trying pro-independence leaders. Cosidó’s message was seen as an effort to dampen criticism within his party’s ranks after Marchena was chosen as the would-be president of the judiciary, thus delegating the task of conducting the trial of pro-independence leaders to a progressive judge, Andrés Martínez Arrieta. One response to Marchena’s announcement came from jailed former ministers, Oriol Junqueras, Raül Romeva, Josep Rull, Jordi Turull, as well as activists Jordi Cuixart and Jordi Sànchez, who on Tuesday morning applied in writing to the Supreme court to recuse the judge. Questioning Marchena’s impartiality in overseeing the trial of pro-independence leaders, the application to have the judge removed also cites the ‘political agreement’ between the Socialists and PP. Yet, a senior PP official told Spanish radio that the party already considers the pact with the Socialists to be ‘broken’. Party vice secretary Javier Maroto also blamed Pedro Sánchez’s government for ‘leaking’ the messages. This came as Sánchez urged PP ‘not to break’ the appointment deal ‘because the most important thing is institutional renewal and normality’. The Spanish Prime Minister also said he ‘regretted’ Marchena’s decision to back out. Meanwhile, Socialist minister, José Luis Ábalos, said in a radio interview that PP is an ‘obstacle’ to democracy and he doubted whether the Socialist government could reach agreements with the conservatives. The minister also expressed surprise, not that Marchena had decided to withdraw but that Cosidó should still be in his post as a PP party spokesman following the leaking of his messages. However, the new PP president in Catalonia, Alejandro Fernández, said there is no need for Cosidó to step down, as the leaked messages were part of a ‘private conversation’, while he described Marchena’s decision as a ‘gesture of dignity’.